Twelve years ago, T. Colin Campbell, an American biochemist and Professor Emeritus of Nutritional Biochemistry at Cornell University, published The China Study, a book that examines the relationship between the consumption of animal products (including dairy) and chronic diseases – heart disease, hypertension, diabetes, prostate cancer, breast cancer, and colon cancer. Specifically, the study followed more than 6,000 people from 65 counties in China concluding that the people who consumed more animal products had higher death rates than those who consumed more plant-based food. The results were nothing short of extraordinary. 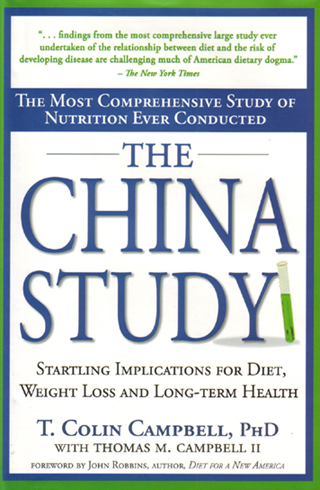 So, why hasn’t everyone heard about The China Study (although the book did sell more than a million copies), plant-based diets, and how nutrition has the ability to prevent these diseases? The answer: the suppression of information by the powerful, well-funded people and organizations that have an economic stake in the livestock, dairy, and pharmaceutical industries. Steve Forbes narrates a portion of this film which shows how Nelson Campbell (son of T. Colin Campbell) set out to tell people of one of the most important discoveries of our times and how he is continually blocked in his efforts. Not one to give up, Nelson realizes that a revolution cannot start unless there is awareness so he sets out to make the public aware of the information they need to live healthier, longer lives. Beginning in Kentucky with the State Legislature, he quickly learns how powerful the meat, dairy and pharmaceutical industries are when a bill to set up a pilot program documenting the health benefits of a plant-based diet is crushed. Undaunted, Nelson decides to take his message back to his hometown – Mebane, North Carolina – a town known for its passion for barbecue and all things fried. Convincing 12 people to join a pilot program for 10 days, Nelson and a large group of supporters conducted medical screenings, took blood tests and then provided all the prepared food to the 12 volunteers for 10 days. At the end of 10 days, more blood tests were taken and compared to the previous tests. The before and after numbers were astounding with weight, cholesterol, blood pressure, and sugar levels dropping dramatically (one man’s disbelief upon learning his cholesterol went from 279 to 150 is hilarious). Word spread and subsequent pilot programs continued in Mebane with all programs ending with the astounding results supporting the power of a whole food plant-based diet. Empowered, Nelson decides to go back to Kentucky (since Kentucky’s inhabitants are some of the most unhealthy in the nation) and try again traversing the political realities to get a bill on the floor of the Kentucky State Legislature. When a bill recognizing Kentucky State University along with an addendum that mentions the power of a whole food plant-based diet makes the floor, Kentucky legislators look like a bunch of uninformed puppets asking Nelson if he would consider adding the word “meat” to his addendum? Yes, a legislator really did ask that question and its one of the most telling moments in the film because it shows the viewer that the legislators are either firmly in the pockets of the livestock, dairy and pharmaceutical industries or in complete denial. That they all look like they’re on statins, blood pressure medication and/or insulin makes the situation that much more ironic. Vastly entertaining, Nelson Campbell is the epitome of patience and the ideal guy to lead the PlantPure Nation revolution, which has started and gains momentum everyday. 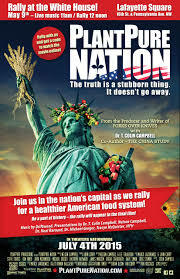 The film is available on Netflix or through the PlantPure Nation website: www.PlantPureNation.com.